Peace NYC, Hello The Brothers Austin. So last Sunday around 5am I made it to Shannon Ireland. I hopped on a bus to Galway, after a few hours wait, as the bus didn't leave until 7:20am so had a bit of a chillout session in the airport, free wifi at least. After arriving to Galway I waited another hour to catch a bus to Ballyvaughan, where good friend Jeff Austin is studying abroad at The Burren College of Art. The Burren is an area of southwest Ireland surrounded by big hills and massive limestone deposits. From Shannon the bus ride down to Ballyvaughan is about an hour, I made it into town and got off the bus in what I considered to be the center of town. A lucky guess as Matt and his mom were staying in the hotel that I happened to walk into to have a coffee. It's called Logues and from what I gather is the only game in town. Waited a bit for Jeff to arrive from his place into town - the school boarding is about 15 minutes walk from the center of Ballyvaughan. Picture of Logues sign offering breakfast, hotel not pictured. So we all met up had a quick bite and Jayne (mother of Jeff and Matt) wanted to go check out The Burren Perfumery just outside of town. 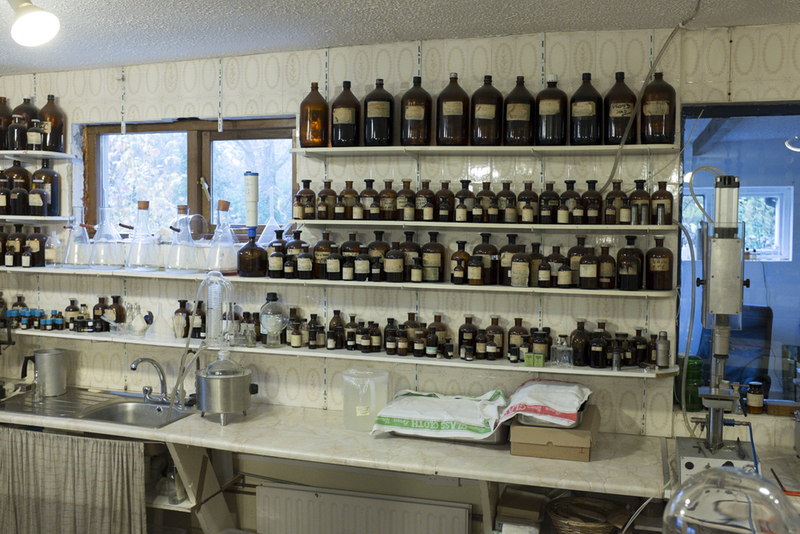 They offered quite a variance of perfume types made from flower extract. They produce other kinds of of products such as direct extract, lotions, shaving soaps and much more. Funny thing is though that the Irish gov't has sort of place a protection status on the indigenous flowers they were using, now all of their flowers are imported - funny how that works out. After that Matt and I went to tour Jeff's studio. The school on the same grounds as an old castle just outside of Ballyvaughan. Super cool - here's a couple of photos. Matt had of course seen it in the time that he'd been there. He even was also gave an artist talk - you can find Matt's work here. An old tower on the campus. Photo of the actual studios and main building. The next few photos are of Jeff's work in the studio. This really great piece below is a wall work comprised completely of dead flies found around the studio. I gathered that the fly aspect has sort of taken over the whole of the program. Lots of dead flys everywhere, and everyone was finding them randomly on walls and around their space. In some instances the placement of the flies was completely unknown adn random. It started to worry me a bit after awhile. He's working on stuff besides flies too so thats good. Really like these concepts he's working with here. Strays into design and utility concepts. Jeff has been really productive in his short time here. It's great to see his developed ideas inside studio. He's gotten into a groove and found a style to work with that can carry through to the future devlopments of his work. Check out more of Jeff's work here. Safety first guys ok. Thats Jeffs residence in the background. Matt playing a ukulele Jeff bought on his time here. Jeff looking really excited to see me. Now it can be said - why in heaven's name did you go visit two guys you know from back home for a total of 10 hours in a small nowhere town of southwest Ireland? Well fact is that I couldn't resist. Its not that I'm chasing the feeling of familiarity when I'm traveling but really, why wouldn't I opt to see them? I've found that it really changes everything when you see someone over a great distance later. This summer when I found friends in LA that I had known in Addis it was really great to see them. We continued building a friendship and the importance grows because we cared enough to meet over such a distance.